The Integre IP-CamLink is an end to end frame grabber solution for Camera Link processing of image data and image enables that are deserialized from Channel Link interfaces. Inclusive of all Camera Link defined camera configurations including the proposed 80 bit extensions which utilize one to three Channel Link or equivalent devices. Supports single camera or two independent base cameras for multi-view or 3D stereo applications. Fully synchronous pipeline architecture supports high speed implementation in low cost logic devices. Dynamic reconfiguration of the processing chain via register interface in addition to a user selected default setup. Data resynchronization of the three Channel Link interface inputs for coherent pixel data presentation at the output. Output image data presented on an eight byte memory mapped pixel interface as depicted in the Camera Link specification. 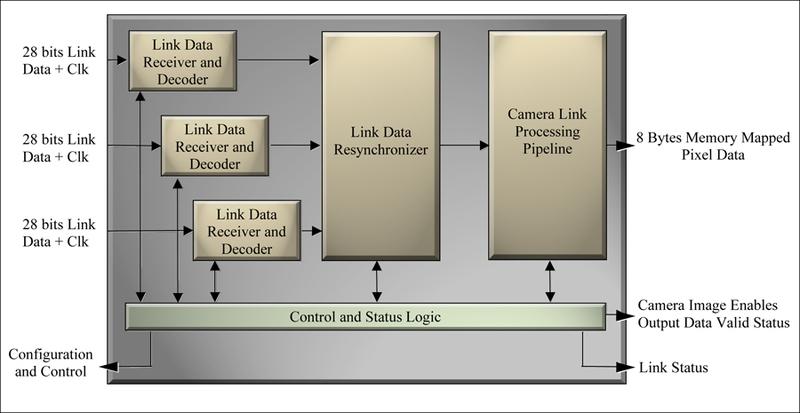 Camera image enables are carried through to the output with an added data valid qualifier for the streaming synchronous output. Input link status and link data resynchronization status outputs available for increased visibility and enhanced debug capabilities. The IP-CamLink core as delivered is warranted for one hundred days from purchase delivery date. Phone and Email support is included for the first thirty days. Optional maintenance and support agreements are available.